The Sheridan apartments at 71st Street and Cottage Grove Avenue—across from Oak Woods Cemetery—had been an unofficial landmark of the Greater Grand Crossing community since Benjamin Harrison was president. 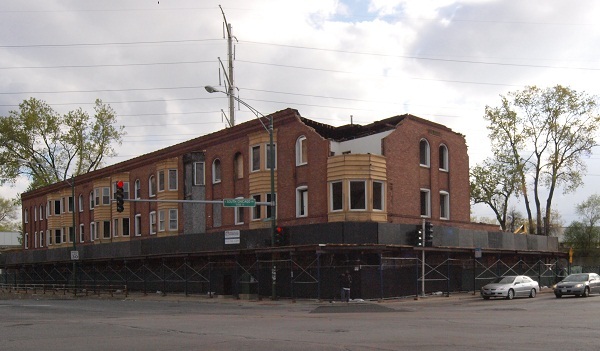 But after more than 120 years, the long-vacant dilapidated three-story brick building with prominent bay windows is now being wrecked by the city under court order. Demolition equipment has ripped away the west side of the Sheridan as of today, exposing its interior. The Sheridan&apos;s demolition had been under an automatic 90-day review because the building is listed in the city&apos;s Historic Resources Survey as having potential landmark qualities, but the hold was released April 25. A city spokesman had no information on site&apos;s future, but here&apos;s hoping something gets in the works soon. Too much of the South Side is vanishing under the wrecker&apos;s ball, leaving large tracts of undeveloped land in neighborhoods like Greater Grand Crossing returning to prairie. And less than 10 miles from downtown Chicago. Add the senseless and ongoing violence to the mix and the symbolism of the Sheridan&apos;s demolition is jarring. Once the building is razed, its intersection will be marked by a vacant lot, a police station and a cemetery. 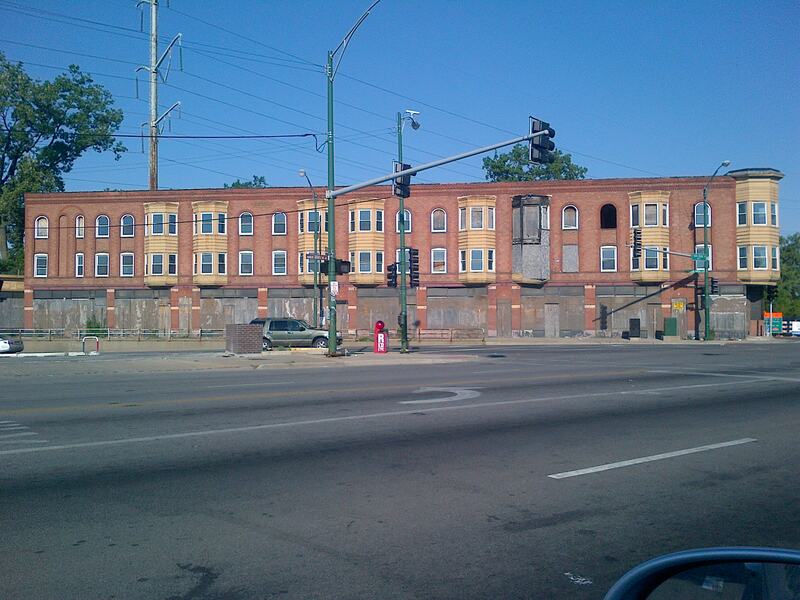 Built between 1890 and 1891 on the six-corner intersection of 71st, Cottage Grove and South Chicago avenues, the 16-unit structure is a remnant of the residential building boom in the years surrounding the 1893 World&apos;s Columbian Exposition held in nearby Jackson Park. The Sheridan has been vacant since the mid-1990s. The city filed suit in 2008 to get the owners--who had attempted to convert the place into condominiums--to repair the property after inspectors found fire damage, rotting wood porches, crumbling brickwork, holes in floors, shifting exterior walls and evidence of squatters in the building. Heating, plumbing and electrical systems were also stripped out, a city building inspector testified. 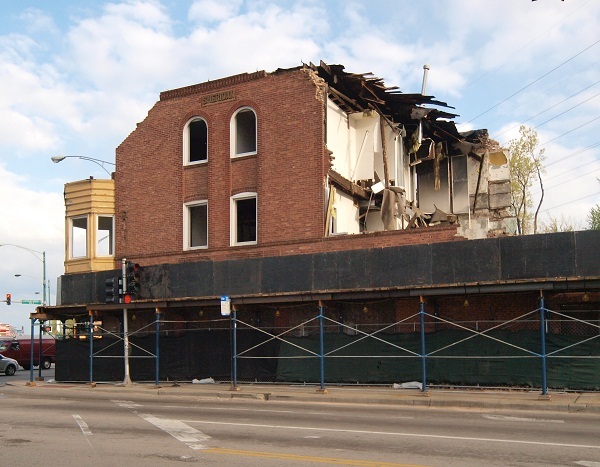 The demolition case made it all the way to the Illinois Appellate Court. The court ruled in favor of the city this year and you can read the file here. South Shore resident Maurice Rabb has watched the building for years. "I remember eyeing the building as a kid in the &apos;70s and &apos;80s every time I came up South Chicago Avenue with my mom," Rabb said. "It was an odd, yet handsome building [and] I always wondered whom might have lived there."